ForgeCraft Games knows a rose by any other name would smell just as sweet and so they've renamed their StarFire Command game to Quantum Expanse. The decision to change the games name was made to better reflect the game's setting and overall story line. 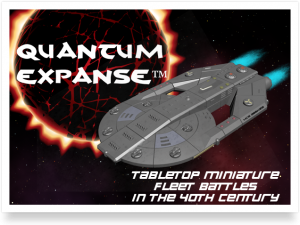 Quantum Expanse is a tabletop miniatures game where all factions in the expanse strive to control of a new source of dark matter crystals, which trap dark energy, that when released creates huge levels of quantum energy, allowing for all faster than light travel. Can you lead your faction's fleet to victory and dominate the expanse or will your fleet be crushed and your faction brought under the heel of another? Only time will tell if your strategies, tactics, and fleet command skills will allow you to grasp the ultimate prize. Quantum Expanse features many new innovative features such as; fog of war stealth system, simultaneous combat mechanics, and many great looking highly detailed ship models and counters. Quantum Expanse is scheduled for an October 2012 release.